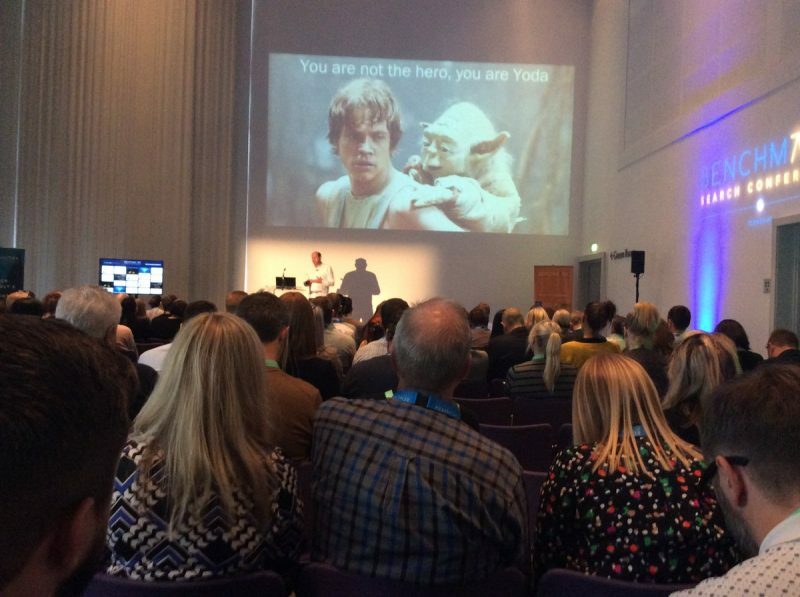 Returning to Manchester’s iconic Bridgewater Hall, the third running of Benchmark was bigger than ever with more than 250 delegates attending to hear 15 fabulous speakers and two expert panel sessions discuss all things digital and what businesses can expect in the coming months. The event, sponsored by Manchester Metropolitan University, 360 International Advertising, DeepCrawl, Digital Agency Network, Juice and Majestic was the largest to date and included esteemed guests from some of the world’s most recognisable brands. Topics covered ranged right across the search marketing spectrum from SEO to PPC and CRO to social media and storytelling. Attendees were greeted by Chief Growth Officer at DeepCrawl, Jon Myers who opened proceedings welcoming them and expressing how impressed he was by the growth and quality of the line up. 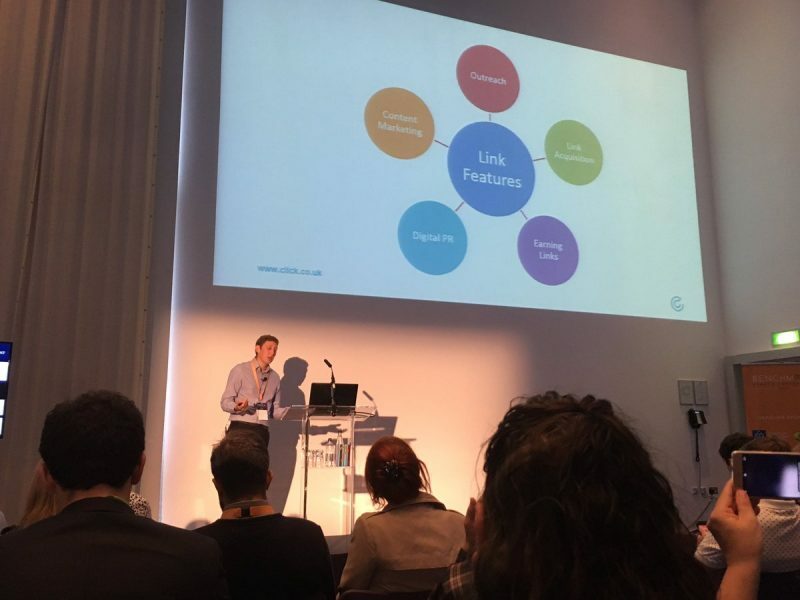 The opening session had a heavy SEO focus with presentations from Omi Sido, Senior Technical SEO at Canon Europe, Applied Futurist Tom Cheesewright and our very own Director of Search, Alan Reeves. Omi opened proceedings discussing the future of SEO and the importance of RankBrain in 2017 and how machine learning plays a very real part in search. He touched on the fact that there could be upwards of 200 ranking factors and that relevance is key to success when it comes to links and content. Alan followed Omi with an insightful piece on SEO strategy and its relationship with good competitor analysis. Talking about his passion for classic cars he explained the process of identifying keywords and implementing a strategy within the market. Alan also touched on how businesses can prepare and evolve their strategy to always keep ahead of the curve and identify new ranking opportunities in the future. The future of SEO remained a theme with Tom who discussed Life after search and tomorrow’s discovery engines. The overwhelming message was that ‘technology cuts friction’ and if businesses are able to create a seamless customer journey on all channels then sales will surely increase. He added that augmented reality and visual search were the next big changes to come to market and that all companies should prepare for this. ‘Imagine using glasses and cameras as a wearable tech to check the fried and place orders when your milk is reaching sell by date or is running low’ he told the audience, before adding ‘this is the future’. With such an engaged audience and some questions from the floor there was just enough time to fit in a quick coffee break before four more superb speeches took us to lunch. The second session before lunch included Anu Adegbola, Paid Performance Manager at Zoopla, Bas van den Beld Digital Marketing Strategist and Founder at State of Digital, Click Consult’s Head of Paid Search David Karellen and Amanda Coleman, Head of Corporate Communications with Greater Manchester Police. Not for the faint of heart, Anu started with a fantastically in depth speech, covering advanced Excel formulas and the tricks businesses needed to know to get the most out of their data. Her engaging talk proved a real success and had the audience furiously scribbling down notes to improve their future performance. Up next, Bas enchanted the crowd with his speech covering the importance of storytelling and how businesses have to harness creativity in their content to deliver results and provide the best user experience. He took us on a journey and demonstrated how brands like Nike had been telling personal stories for years, before revealing to the audience the tale of Airbnb and how chance encounters sometime make the best businesses. Following on from Bas was full time PPC maestro and part time comic, Dave Karellen who used joke books as a way to prove that creative ad copy was a must. He discussed all types of ads and explained the importance of testing. One of the key takeaways from Dave’s presentation was that if you harnessed a mix of data and creativity and leveraged ad copy across devices and time you could increase relevancy and conversions. He finished with the revelation of a ‘joke book sized’ gift, wrapped up for the lucky winner of a competition he ran, in which the audience were invited to come up with ad copy for a joke book and submit it via Twitter. In the final talk before lunch, Amanda Coleman gave a thought-provoking speech about communicating in troubling times. She referenced the tough time that Manchester has been through since the terrorist attack in the arena last May and how GMP had dealt with reporting the atrocity. She highlighted the importance of being both clear and sensitive when it came to communications and that there has to be an ongoing dialect with all parties. After a light lunch and more networking, delegates took their seats again for the afternoon session. Zak Edwards, Managing Director at Prezzybox opened with an insightful talk discussing how it was far better to learn several skills and not just master one. His ‘jack-of-all-trades’ message was well received, caused several roars of laughter and gave businesses the key information they need to ensure they have a diverse workforce in an ever changing market. Up next Paul Morris, Digital Marketing Director at PZ Cussons told the audience not to neglect areas of low interest, and came up with some creative and informative ways to engage their audience. The final talk in the third session was from the returning Nick Wilsdon, SEO Lead for Global Channel Optimisation at Vodafone. Nick has spoken every year at the conference and once again he delivered an informative and engaging presentation on the rise of mobile. It was acknowledged that we are operating in a truly mobile first environment and warned the audience that big updates could be expected from Google ‘just after Christmas’. He spoke of mobile data growth being around 65% in 2017 and emphasised that video was one third of all data traffic, which meant that businesses had to act fast in order to ensure they were meeting expectations in terms of search. He touched on how brands were clamouring for position zero and that if they were responsive to changes and prepared for further updates they’d be in the ‘sweet spot’ of search. Again the audience took the opportunity to grab a quick coffee before the final session of the day where they were greeted by the enigmatic Lukasz Zelezny, Head of Organic Acquisition, uSwitch, who apologised for keeping his talk to 20 minutes as he had a flight to Paris booked for a surprise birthday treat for his partner (which he’s forgot about!) after a few laughs he got on to the subject of the SEO gap and how you can fill it. One of the most important things to come from this session was the importance of not just being on page one but being in the top three positions. Search results are weighted in such a way that the majority of conversions come from those slots. David Edmundson-Bird, Principal Lecturer in Digital Marketing & Enterprise, and Associate Director of Digital Innovation at Manchester Metropolitan University was up next and encouraged the businesses attending to take on graduates and to offer up projects for the students to gain experience. He emphasised that SEO couldn’t be taught but the skills around the industry could be, and that taking on and encouraging undergraduates could be highly beneficial. The penultimate talk of the day came from Sabrina Garufi, Agency Development Manager with Google who spoke about measuring complex customer journeys and why we have to move beyond last click. Last but not least the conference closed with Gerry White from Just Eat who talked about security in his talk titled: Time to migrate to HTTPS – The simple way to do it right, and the ways that the bigger companies have missed the mark, before Jon Myers thanked everyone involved in the conference and of course the attendees, who were then offered the chance to wind down and do a little more networking with drinks sponsored by Majestic at the Innside, deansgate. Interspersed with the main sessions the audience were invited to two breakout sessions where they could speak to a selection of panellists and ask them the burning questions of all things search. The panel sessions were well received and the feedback was that the Q&A format allowed for a deeper sharing of knowledge. Over the coming weeks they’ll be plenty more content including videos of the talks and blogs from the speakers. We’d like to thank everybody who attended and made the day possible.